A little boy always pops into my heart - he has shining eyes, a bubbly smile and laughter that is almost melodious and lyrical. I can close my eyes and see his face burst into smiles. He's a miniature "me" - so to speak. And maybe that's why I adore him more than words can express. A few months ago, a senior Seva Dal in Puttaparthi had the most surprised look on his face when he saw a little boy called Vihaan Rajit remove his sandals carefully before entering the room, do a full padanamaskar in front of Swami's portrait and then come to answer questions related to his identity and passport. He bowed to the Seva Dal with a bright smile, his hands folded in namaskar, saying: Sai Ram. The Seva Dal turned to my father and asked, "He's your grandson from Sydney?" When my father nodded, the Seva Dal looked stunned and he said, "We rarely find our kids show humility or respect to elders these days." Vihaan Rajit turned 7 years old last week. How quickly he has grown up! 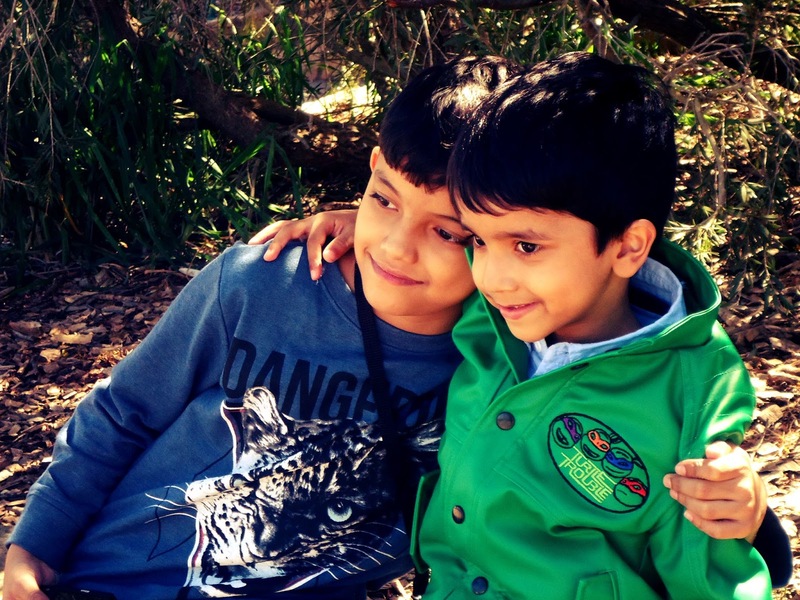 It's quite an experience of sorts when Adi and Vihaan get together. They are up to all kinds of pranks. Vihaan adores "Adi chetta" and tries to do everything he does. When he was a toddler, he first began to crawl up the stairs in my parents' home when he saw that Adi can easily climb the stairs! He also tried using Adi's tricycle for the first time and the two had quite a "It's mine, it's mine" tussle around it. As kids do, they both wanted to use it at the same time! I recall an instance when an older kid told Adi, "Lets go out to play but leave him behind...."
Adi's reply was instant, "I can't do that. He is my younger brother." Whenever I recall this, I say a silent prayer to the Almighty: May this always be. Let this love not lessen or change. They always hug each other tightly and sleep. And when one of them has to go somewhere or be apart, the other one cries, mopes around and doesn't even eat properly or watch cartoons. If you ask , "Are you missing your brother?," you receive a noncommittal, boyish reply which means nothing and can mean everything if you choose to interpret it. Guys, i tell you! Why can't they loosen up a bit at least with moms? The moment the other returns, all hell breaks loose and there's madness all around that you wish for some peace and silence once again. A few months ago when we were sitting together in Prashanti Nilayam, Vihaan asked me a question: "Do you love me or Adichetta?" I like to tease Vihaan a bit so I asked him, "Well, you know the answer. So, what do you think?" He gave me that super sweet smile and said, "I know you love us both equally." Another amazing thing is the effort he takes to win over people's trust and love! He doesn't hesitate to call Sanand and chat with him like for 45 mins at a stretch! 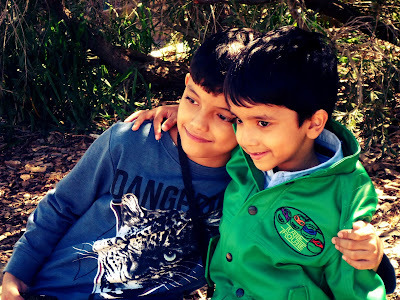 When Sanand and Vihaan hang out together, everyone else have to take a step back because the two guys get along so well and just leave out the rest of us! The sweetest conversation I've heard between Vihaan and Sanand was when Aishani - my sister's daughter - was born. A thrilled Adi told Sanand on the phone, "She's my carbon copy, Acha. If you compare her baby pics with mine, you will think we are the same." Immediately, little Vihaan takes the phone from Adi and tells Sanand, "Actually Valiyachaa, she's my carbon copy too...you have to believe me..."
Whenever I think of my boy Vihaan, my world feels whole and perfect. He makes me feel that I have one more son to treasure and a rich new world of sparkling laughter and innocence that I can look forward to. The power of love is strongest when it comes from the heart, untainted by expectations or desires. And when such love begins with you, that makes you the richest person in the world. Trust me, that's how I feel - because of my two boys - Jyotiraditya and Vihaan. They are my world. And I love them both. Equally. Good one, the joys of parenting never ends !